Before I "explain"... Here are links for you directly to some Arduservers you can try. I won't promise that all will be online 24 / 7. However, at least one is usually standing by, ready to serve you. Each link will open in a new tab or page. Just close that to come back here. The rest of this page has become rather "messy" over the years. I apologise! Almost all of the above "appear again", below, in the context of text about them. Your browser should indicate a visited link. If the ArduServer you visit seems to be behaving strangely, remember that someone else out there in internet-land may be playing with it at the same time as you are... but I don't think that you will "see" each other.... although I may be driven batty by the LED going on/ off/ on/ off in front of me on my desk! (On some of the servers, you can see how many clicks the server has processed, and thus know if others are playing concurrently. New, 12/16..., and, being new, it may not always be "up", but it is on a platform that I am liking very much... $16, 80 megahertz, lots of memory... and WiFi capable! ESP8266, the Sparkfun "Thing" (Dev Board) version. Programmable from Arduino IDE. If it is "up" at the moment, you will find it at http://mon7nc.dyndns.org:1201/. At 19 Jan 17, only the first temperature is connected to a sensor. The other items in the machine-friendly line are not yet connected to much... but that would be trivial. For more details on the $16 Arduserver (software free, as sourcecode), see http://sheepdogguides.com/elec/misc/esp8266/Esp8266-Arduserver.htm. There is a second instance of the same type of Arduserver at http://mon277rr.dyndns.org:1200/. For this instance, the first counter is actual anemometer counts and the two temperatures are real temperatures in CT, USA... one indoors (in a little used, under heated, room), one outdoors. The two servers produce very similar pages. But look at the version lines, and the data lines, and you can see they are different. 1) A replacement for the original ArduServer. (The link will open in a new tab or window.) Have a "play"! At "A" we have a nuElectronics ethernet shield, one of the old (inexpensive!) interfaces build around a Microchip ENC28J60 chip. The board's long dimension is 7cm. At "B" is an LED taped to a phototransistor. See the text below for what this is about! At "C" is the Modern Device RBBB Arduino running the ArduServer. It is hard to distinguish from the protoboard behind it, but it is about 11cm wide, 1.5 cm high. 12 Oct 2011 ArduServer1 was upgraded. I moved the LED to a different pin, re-wired the light level sensor, removed the "Random", replacing it with a click counter. If you are working with code from before that date/ time, I strongly recommend that you upgrade to the latest. If you want to keep the LED on the old address, it only takes a change in a single line. Characteristics of ArduServer1: Inexpensive! Built for $40 with a Microchip ENC28J60 chip on a NuElectronics shield and a ModernDevice RBBB with just a little Atmega168, which has only 16k of storage! (The RBBBs will take more modern chips, and are, October 2011, supplied with Atmega 328s (), your choice of 5v or 3v3 versions. Kits (easy): $13. Kit with USB one-cable/ many Arduinos "BUB": $25. (You will need a BUB or equivalent with RBBBs and similar.) 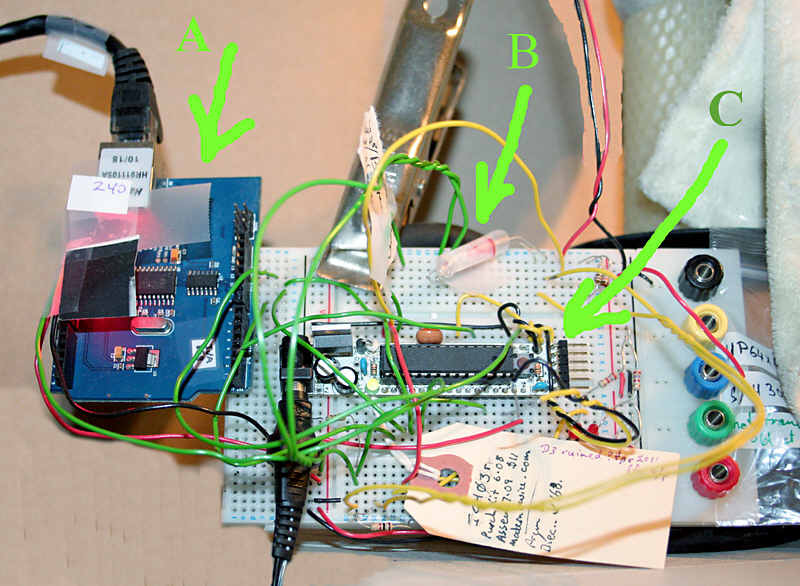 FOR NOW: See the already mentioned Sheepdog Guides Tutorial: Serving web pages with an Arduino. I have put the details of the shield online in their own page... useful even if you only want to copy the circuits on a breadboard. I have software which allows me.. from afar... to automatically check the temperature around the ArduServer2 from time to time... I do it three times an hour. The software, running in the PC where I am, not where the ArduServer is, starts beeping if the temperature at the ArduServer is too low, presumably because the heating has failed and needs attention. 3) ArduServer3 (That will open in a new tab or window.) Have a "play"! 4) Going a step further, I have produced Arduino and Windows code for what I've called ArduSimpSrv. This, too, is an Arduino server, but it is not a web server, it is a more Simple S(e)rver. Good because it demands less of the Arduino, leaving space for more code to do things besides communicating with clients. Bad because you will have to adapt the client software I provide, to meet your wants regarding benefits from your ArduSimpSrv. It has been online since about 1 October, but, as you need the client software to "play" with it, there's no point in listing the URL here. It is in the tutorial, along with the instructions for downloading the client software.